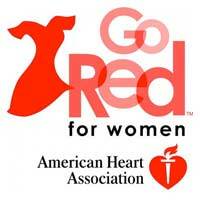 Thanks to the 156 faculty and staff who contributed $1,065 to the Go Red Campaign sponsored by Webster Wellness. These contributions will go to the American Heart Association to support educational programs to increase women’s awareness about their risk for heart disease and stroke as well as support critical research to discover scientific knowledge about cardiovascular health. For the past several years, Webster University has actively participated in the American Heart Association’s National Wear Red Day campaign, Go Red for Women. Friday, Feb. 5, is your chance to join your Webster colleagues and people from all over the country in fighting heart disease in women. Make a donation of $5 and wear jeans with your red! For donations of $10 or more, you will receive a red dress pin (while supplies last) that you can wear (or share) to show your support for the Go Red campaign. Of course, donations in any amount are welcome. If you’re at an extended site OR would like to donate online, check out our National Wear Red Day Fundraising Page where you can make donations online (on or before Friday, Feb. 5) that will go directly to the American Heart Association and will count towards Webster´s fundraising goal. On behalf of Webster Wellness, thanks for your support! If you have any questions, please contact wellness@webster.edu.